*Blinks* Er... so... I, uh, take it you want me to get on with the post already, huh? So... uh, hello everyone, eheh! Remember me? Swirlshine? The blogger who kinda obviously stinks at responsibilities and hasn't posted since... *checks* August? Yeah, that's me. Eheheh. *Fidgets nervously* So, uh, I take it you've all been wondering where I've been for 4 months? I'll explain that now then. I hope it all doesn't sound like excuses to you - I'm speaking the truth, I promise you! Alright. So first off, you can see that my last post was on August 22. I'm pretty sure that was a few days before the new school year started for me. So yeah, that makes sense, right? Yeah, totally normal - lots of people just need a few weeks to get used to school schedules again! Except uh, yeah, I obviously was NOT gone for "just a few weeks". Yeah... idk. School's been different this year, being in high school and all. Quite interesting, to say the least. Unfortunately, I can't say it's the good kind of interesting either. I'm not trying to turn this into a vent post or anything, promise, but yeesh, I'm not gonna lie - this 2018 school year so far has been rough. *Shakes head* School's quite dumb in many ways, I can tell you that. And stressful. And discouraging. And disappointing. And infuriating. And dull. And- you get the idea. But hey, I won't go into my strange personal issues. 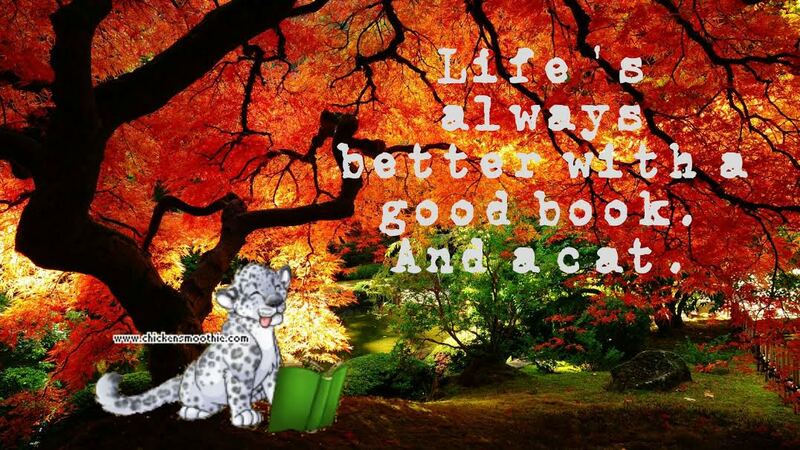 And besides, maybe the 2019 half of the school year will be much better! Anywho, yeah, school's been keeping me busy lately. After a while I ended up forgetting about blogging entirely, and if I remembered, I just... never really felt up to posting, if you get what I mean? Idk, I'm exhausted after school, I like to spend my time in the evening after homework doing other things online, and I just wasn't sure what to post about. All of those things contributed. Okay okay, no, you can blame me for this one. I'm the one who didn't post for months and months because I was not responsible whatsoever. I'm really sorry about that... gosh, I feel awful that I've left you all hanging for so long. I know a few of you have been chatting with me all this time anyway, but for the rest of you that wondered why I disappeared into the shadows of... hiatus-ness, I sincerely apologize - I really, really do. I missed talking to everyoneeee. And I hope me not posting didn't annoy/anger anyone or anything, ack! Sorry again, DX. But I'm posting now because blogging has just been on my mind lately, and I really didn't want 2019 to come and the blog still be dead! That just doesn't exactly seem right to me - not quite sure why, honestly. This post won't be super big and full of of content and all that, and I do apologize, but I DID want to try and do this tag! I haven't done one in ages! So, without further ado (even though that was only like, one paragraph anyway... XD), here's my answers to the "When I'm Older" tag! 1. 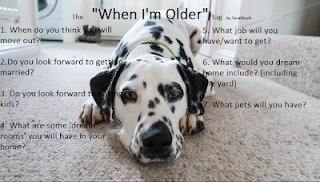 When do you think you will move out? Haha... I'm not really sure! I do like being alone sometimes, but uh, LIVING alone... that's sorta a different story. Definitely doesn't feel as safe as living with others, at least to me. 2. Do you look forward to getting married? I do! I'm sure that's QUITE a long way away though... XD! 3. Do you look forward to having kids? I'm not sure if I'll actually have kids (but I mean... I'm sure all of us don't know that for sure yet... XD), but I'd love at least one! I feel like it'd be nice to raise a daughter, hehe! 4. What are some "dream rooms" you will have in your home? Hehe... know what'd also be cool? If I had a bookshelf-wall that opened up into my bedroom! IT'S A REAL THING, OKAY?! LOOK, HERE'S PROOF!! I'll just say it's KINDA like this! Except you know... there's a bedroom back there. Instead of an office or whatever's in this GIF. And the door-thingy opens differently. 5. What job will you have/want to get? 6. What would your dream home include (including the yard)? I'd like an open and organized living room, a big kitchen with an island, some sort of... idk, unique bedroom for myself (I won't include kids rooms and all that, because uh, yeah, still unsure, XD), and a big yard with some trees, maybe a pool, and an organized patio! 7. What pets will you have? Something like a ferret or whatever would also be pretty cool, but I doubt I'll end up going through with that... you know, considering how many dogs I want. And that it's a weasel-thing. Hm, this post went on for longer than I thought... XD! WELL WOULDYA LOOK AT THAT! I'M DOING THIS, YOU GUYS!!! Ahem. Don't mind my weirdness... XD! A few of my friends and I were wondering what would happen if we all just... lost interest completely and started different blogs and all that. AJ hadn't really been interesting enough to post about lately, after all. 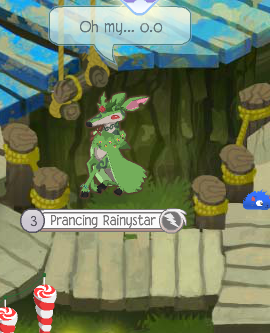 But after thinking about it... honestly guys, I could NEVER quit Animal Jam at this age. The game holds a lot of meaning to me, and I've just made a bunch of memories that I wouldn't want to leave behind when I quit. AJ may not be exciting all the time, but I feel like a lot of similar games are like that, and you just have to find ways to get back into the game again! So that's exactly what I'm working on right now, and I'm proud to say it seems to be successful so far! Anywho, I know I've already been blabbering for this whole post instead of getting to the good stuff... but... before we do that, would you all mind if I addressed an issue that's been on my mind? I just want to make everyone aware of certain things, so that problems can be solved and, y'know, our community stays a good one! So, I'm sure most everyone knows already that our AJ Blogger community is a small one, but one that's rather close as well! By that, I mean that most bloggers are quite kind and friendly to the other bloggers out there, and a lot of us are good friends or at least share something with another blogger! All that is why I love the community, and I want to stay in it for as long as possible! However, I'm aware that there HAVE been some tensions lately. And I'm not trying to scold you like a mother or anything like that (XD), but... I don't know. I don't want our community being torn apart or anything because of arguments! So basically, my message to everyone out there is rather simple. Please, try to be respectful of others and their opinions, and if you disagree with an opinion and feel the need to say so, please do it politely. It really doesn't help to get angry and retaliate, especially continuously. I've found that only makes problems much worse. We all have our opinions for our own reasons, and of course they aren't always the same as others'! But please, if you want to voice your agreement or disagreement with something, please think about if what you're saying will hurt or anger others before you post it! Standing up for what you believe in is totally fine - I'm actually a huge supporter of doing that! But I'd suggest making sure that when you do that, you're not offending anyone else who thinks differently! I wouldn't ever name names for something like this, but I'm sure if you haven't exactly been being respectful to as many people as possible lately, you know who you are. And I'm not technically blaming anyone either! You know in your heart which kind of person you are! I apologize for doing so many screenshot dumps lately, but uh... I STILL DO NEED SOME MORE IDEAS, OKAY? I'L THINK OF SOME AT SOME POINT, DON'T WORRY, XD! Now this species, everyone, is one that is quite rare, called the Glowing Bulbamoth. It uh... has a bulb. As a head. So uh, see that goat on the left? Yeah... the profile on the right is hers, XD. You. Have. A. Pet. Moth. DO YOU KNOW OF ANYONE ELSE WHO OWNS A PET MOTH. IT PROBABLY FLEW AWAY BECAUSE EVEN IT KNOWS YOU DON'T KEEP MOTHS AS PETS OR SOMETHINGGGG. "Time together is just never quite enough"
"When you and I are alone, I've never felt so at home"
"What will it take to make or break this hint of looove"
"We need time... only TIIIIME"
I doubt this glitch still works, but when flamingos first came out, I believe, there was a glitch where if you put a Heart Balloon on, it changed into a Clover Blanket of the same colors on the Change Your Look screen! Kinda like that old seal glitch, hehe! An odd glitch I had a while back, where the phantoms somehow got past the grass into the spawning area in Battle For The Beacon! Another one from not too long ago! 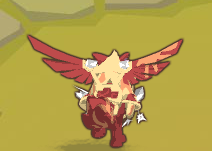 These are actually the Phoenix Armor, but when I put them on my cheetah and ran around, they sometimes changed into Peck's Alpha Armor, just in the phoenix wings' colors! SO I NEVER GOT THE CHANCE TO SAY THIS IN A POST, BUT THE WAY THE DIREWOLVES SIT MAKES ME LAUGH, XDD. Seriously, just look at the floofy dude! He looks so annoyedddd, XD! Honestly, wanna know the first thing I thought when I saw this? But hey, I love the direwolves anyway! They can be quite cute and/or funny, imo (maybe that's just because I'm a fan of pretty much all wolves and dogs, though... XD)! 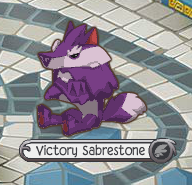 Again, not sure if this one still works, but when I first got a sabertooth (which I also actually like! C'mon guys, these extinct animals can be cute if dressed up the right way! XD), I put a Lei on and realized that a Beard of matching colors appeared as well! DON'T GO LOOKING FOR THAT PICTURE IN MY OLDER POSTS GUYS. SHHHHHH, IT HAS BEEN MADE NEW. OR SOMETHING. Alright guys! Man, it feel good to be posting again! I hope to get back on schedule, although, uh, with... *glances around warily and whispers* school... starting up again soon, it may get a bit inconsistent. Man, I really don't want to go back to school. Like, REALLY. I'm terrified, honestly. I promise you, I'm not. Just busy, and forgetful, and uh... unmotivated? I'm more motivated than before, though! You'll get a post soon, I promise. And I apologize for my unexpected hiatus-thingy. My blog has been dead for quite a while now - for over a month, in fact. I promise that'll change soon, and I'll give you guys my stupid-sounding, but real, excuses, and uh... yeah! Me: *Mumbles super fast* Hey guys so yeah technically it's been like a week or two since I came back from camp but I didn't exactly have any posting ideas so I just didn't post but um yeah sorry. ANYWAYS! I NEED HELP. Me: I'm DYING OF A CUTENESS OVERLOAD. CALL 911 OR SOMETHING. Seriously, guys. I'm in critical condition. A couple days ago, my sister and I, along with our mom, went to go volunteer at our town's animal shelter! And let me tell you, we took a LOT of pictures! XD! First up, meet Toast, XD! He's a sweet lil' puppy who I'm surprised is there (although I doubt he'll be for long! Who can resist a puppy?)! 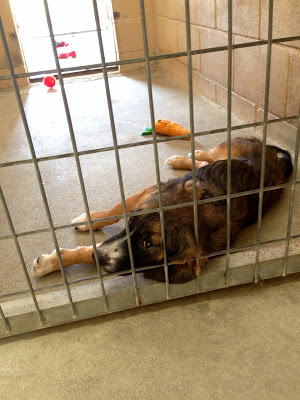 I actually got to go into his kennel and hold him, and AHHH, HE WAS SO ADORABLE!!! Hehe, he sure seemed to think my hair was a toy... XD! This is one of my favorite pictures I took that day - the way he's sticking his nose through the bars is so sweet! Hehe, he really wanted lots of attention! One more of little Toast, for a different view of him! Okay, so, uh... I forget names easily, guys. So I forgot most of these dogs' names, eheheh! But whatever - I do know this girl was super sweet (actually, they all were, XD)! YAAAAYY, ONE OF MY FAVORITE DOGS THERE, XD! I believe her name was Pancake - I personally think she needs a different name, but hey, I'm not in charge of that, XD! And here's the other puppy who was there - Penny (why am I only remembering the puppies' names. XD)!! I actually got to take her out and hold her too! She was very wiggly, XD! But seriously, she was such a sweetheart - I hope she gets adopted soon!! Credit to my sis Velvetglimmer for this pic! A YORKIEEEEE!!! I'm a huge sucker for yorkies, guys! XD! Her name was Iliza, and although she was a bit shy, I still love herrrrrr, XD! When I saw these two (yes, two! There's one in the back if you look, XD! ), I was so happy, because I love Malteses and Bichons, XD! Okay, well, the one in the back is actually a Poodle mix, not a bichon... but CLOSE ENOUGH!! They look super similar anyway, XD! Anywho, these two were adorable (I believe their names were Floof and Fluff, XD)!! The one closest to the camera in this picture, who I think is Floof, was pretty hyper (surprised she sat still for this picture! ), and Fluff back there was more laid back, XD! And now for a couple cats!! This one was named Trixie, and, once again, this is one of my favorite pictures I took there, because the way she stayed put and looked straight at the camera made it turn out really good, imo! Now if only I could remove those bars... XD! Anywho, I loved her because she seemed very curious, but still quiet and rather shy! 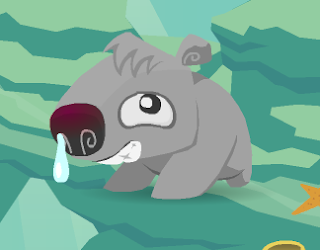 I probably like shy animals because I'm shy myself... XD! Aaaand HERE'S A KITTENNN, XD! I know it's a bit blurry, but I couldn't resist this little guy's expression in this! I somehow got him meowing, XD! He was a very cute but VERY talkative kitten, XDD!! Sadly, we weren't allowed to take him or his cage-mate out to hold them! And lastly, a couple more kittens! I remember the black-and-white one was called Fluss or something... but I can't remember what the orange one's name was! Anywho, these guys were cute, but MAN, did they act like siblings (although I don't think they are? ), XD! They kept purposely annoying each other and getting mad, but it made me laugh, because come on, they're kittens! XD! So this post didn't have much of a... er... important... point, did it? Anywho, I hope you guys liked all these! Sorry for this mess of a post - I promise I'll try to get something better up soon! Until next time, remember to party hard, be kind, and be unique, and I'll see you guys (hopefully) soon!!! Hehe, testing out some new outros - don't mind me! MY LAST DAY OF SCHOOOOOOOOLLLLL!!! Ahhh, I'm so excited! This summer's gonna be awesome, I just know it, XD! There's so many things I want to do, and I hope I get to do all of them, or at least most! Posting more and finishing Larry The Bunny (AT LASTTTTTT, I know) are two of them! I doubt I'll have time to make another post before Monday, so I suppose I should say goodbye now! Don't have too much fun without me, XDD! Okay, nvm - have as much fun as you want, XD! BEFORE YOU GUYS START YELLING AND THROWING THINGS AT ME OR DOING, UH WHATEVER, LET ME EXPLAIN! I guess you could call this an unexpected hiatus of sorts, and I apologize for it being unplanned! I've been kinda busy trying to finish up my last few days of school, but if I'm being honest here, it's mostly because I really ran out of posting ideas for a while there, and I didn't quite feel like posting. I don't know WHY, exactly - I just didn't. But anyways, I just needed a bit of a break, and now that I've had one, I'm back and ready to post again! I figured I'd clear out some more pictures that have been rotting in my files today, so let's go ahead and get on with that! Yup!! It still does! With any animal too, XD! 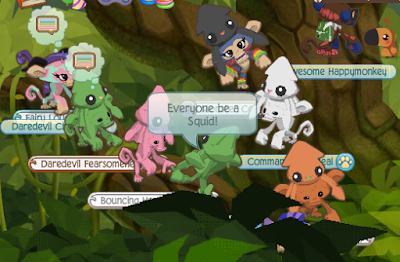 Gosh, I guess AJ animals can levitate now! Wow. That's a, uh... good comeback?? I really dunno what these two were arguing about, XD! I get they meant "I got scammed my long, :(", but #1. Why type out "sad face", and #2. It almost sounds like they said their long sad face was scammed, XDD! WAIT WAIT, I'M GONNA MAKE AN EDIT FOR THIS! OM, I JUST LOVE TEENSIES! MHM, I'VE HEARD ALL ABOUT THEM! THEY'RE SO... TEENSY! 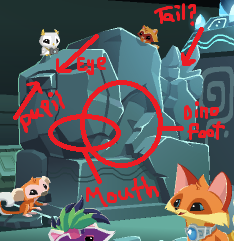 I took this one just a few days ago, because I noticed that the gizmo pattern (and maybe others too) doesn't seem to disappear underground when the dire wolf's snout does! Guess they got left behind, XD! Also, WHY is that dirt so RED-LOOKING. What animal... OH, RIGHT, MY RED PANDA! Okay, yes, I get it - "new barn" = "newborn". But new barn looks hilarious, XD! Almost as if they're asking for a daughter who's a barn? Also, do people still roleplay as a newborn anymore? They wouldn't get to do much... XD! And lastly, taken just a few minutes ago, my glitchy Jammer Wall Masterpiece, which for some reason decided it was staying put! XD! I'm Back- With Some Tags!! *Sighs* Okay, I promise guys, my period of inactivity will be over soon! I've been super busy with my school play, but the performances of it are this week, so after that, I'm officially done!! I'm quite excited to be going home 3 hours earlier than I have been, XD! That will also mean that you'll be seeing more posts from me!! YAAAAY, XDD! Anyways, I saw that a couple new tags have been made recently by Violet and Ja, and I've been wanting to do them for a while now! So let's do those now, XD! First up, the Official AJ Blogger Tag, made by Vi!! 3. 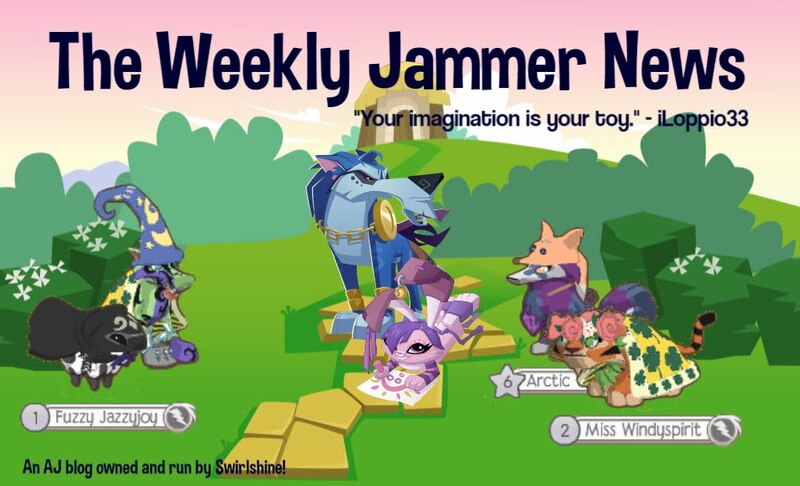 I write for this blog, The Weekly Jammer News, of course, and I'm also the Saturday author on the Animal Jam Artists Collaborative! 4. Hehe, well, yep, this is my own AJ blog, of course! I'd like an IRL blog as well, but I usually post what goes on in my life on here anyway, XD! Plus, I'm pretty cautious about what I put out there! 5. I've been blogging for about 4 years now, I believe! Goodness, I've come a long way, XD! 6. 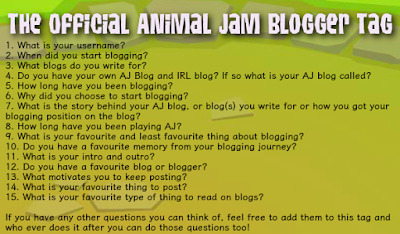 If I'm being entirely honest, I first started blogging because younger me had seen how popular the Animal Jam Spirit Blog was, and wanted some fame of her own. Over the years, though, my way of thinking changed, and now, I continue blogging simply because I love writing and meeting new people online! 7. The story behind this blog is basically what I put in #6, and I was hired as an author on the AJAC because of my passion for art! 8. I've been playing since September 2013! 9. My favorite thing about blogging is the community! It's an amazing group of kind writers with lots of similar interests, and I found my best friends because of it! My least favorite part would probably be how time-consuming writing a post is, XD! It takes me quite a long time! 10. Just growing up and changing my style is honestly something memorable to me! I'm glad I'm not as cringey as I used to be, XD! And talking with the other bloggers is super fun as well!! I love being crazy and joking around with people, XD! 11. My intro? Well, I don't really have a specific one! I use the "Swirlshine Intro" a lot, though, which is the intro style with all the "You Guys:" and "Me:"'s, XDD! And my outro (which I've been thinking of changing, XD), is always some form of the phrase "Remember to party hard, be kind, and jam on!" It's from my early days of blogging, but it stuck with me for some reason, XD! 12. I do not! Every blogger's blog and personality is unique, and I love that! Plus, I'm just a person who really doesn't pick favorites! 13. All of my amazing friends, and just the fact that I love writing about my life and ideas with a purpose!! 15. I'm with Lost on this one- if the blogger likes posting it, then I like reading it!! Did I even use ONE period in this WHOLE post so far?! I'm not seeing any! Goodness. Anywho, thanks for making this tag, Vi, and Lost as well, for convincing me to do this tag because of your post! Last but not least, we have Ja's Instrument Tag! I thought this was a really cool idea, so I decided I'd give it a go! 1. I do! I play guitar, and I'm currently in the "advanced" group! Can't say I'm super amazing yet, but I really love playing songs on the guitar! 2. My favorite instruments are the guitar and piano! 3. The guitar is great for upbeat, happy sounds, and pianos are beautiful for slower songs!! Since I like many genres of music, I enjoy different instruments a bit more at different times, XD! 4. Oh goodness. No hesitation on this one. 5. 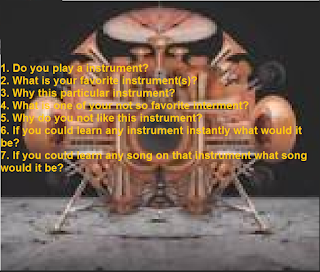 Can the kazoo even be considered an instrument?! I swear, it just hurts my ears every time I hear it. I CANNOT. STAND. KAZOOS. XDD! 6. I'd go with piano! It seems hard to finally become an advanced piano player, but I would absolutely LOVE to know how to play such a wide variety of songs on that instrument! 7. Oh goodness... do I have to choose?! I love so many piano songs, aaaah! XDD! I seriously can't pick just one song, but I can say that I'd absolutely love to try Be Brave by Owl City on piano! Of course, I can't do the electric guitar parts, but quite a lot of the song is piano, XD! Plus, it's just overall a breathtaking song, in my opinion! And there you have it! My answers to two awesome tags!! YES, IT WAS A PRANK, AND YES, I'M SORRY FOR SCARING EVERYONE!!! If you don't know what I'm going on about, my bad! I'll slow down and start from the beginning! So, on Saturday, some of you may have checked my blog and noticed something different. Or a few somethings. Such as an all-black profile picture, a cleared Blogger profile, a blank post, and my Blogger username changed to "S.D." I promise you guys, I wasn't being hacked or anything! That was just an, uh, April Fools Day prank. Actually, I ended up telling most everyone who I noticed was freaked out by this whole thing, because ack, I just can't let people worry about me when the whole thing's a prank and I'm fine. That's not fair, and it's almost lying, in a way. Idk, but I'm sorry. Most of you know why all that was changed already, but my apologies again! Didn't mean to absolutely scare you or anything! Hello hello everyone!! Hope you guys are having an awesome week so far! But honestly, I love taking a break from school, since it's gotten pretty stressful lately, and sadly, that's not going to change anytime soon. State testing is coming up, and so's the school play and solo and ensemble (for choir), so, uh, that'll be fun, eheheh. Aaaaanyways, now that that odd intro is out of the way, why don't we just dive right into the topic of this post? So, I'm sure we've all seen this by now! 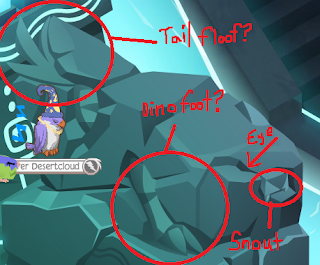 Apparently, a stone carving that resembles an animal has appeared in the Temple Of The Ancients. Now, let me just say, when Sarah first showed me this a couple days ago, I saw that carving completely differently. Like, this is what I saw. Yep. To be fair, though, it showed up blurry for me, so the triangle-in-a-square thing looked more like an eye at the time. 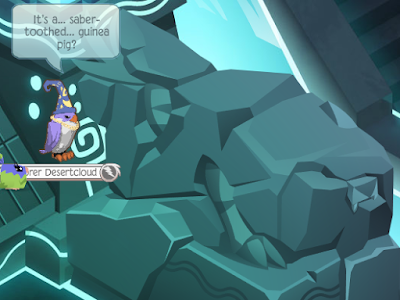 Sarah can tell you herself that I kept screaming it looked like a ancient capybara with a dinosaur leg, XDD! Anyways, looking at the ACTUAL statue (and taking a second look at the picture), I realized I had no idea what it was. However, while flying around the Temple Of The Ancients as my falcon, I did realize something! There are two egg-looking things at the tops of two of the... tower things! Honestly, I have no idea if these are a new addition, or if I've just overlooked them all this time, but they're certainly mysterious! Maybe some new statue-things will be found because of those two eggs? Or maybe the eggs are fossils themselves! Or maybe they're just decorative egg-looking tower points. I'm not sure. But the striped one seems to have the overlapping issue (like the one at the Summer Carnival, with the clothes items booth) already, and that COULD mean it'll be altered in the near future! So, what do you guys think? 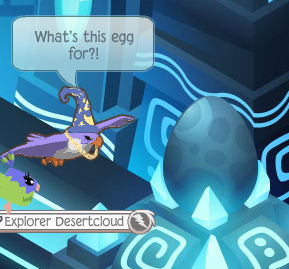 Have you seen these egg-things before, or do they seem new to you? Do you think they could end up being ACTUAL eggs? 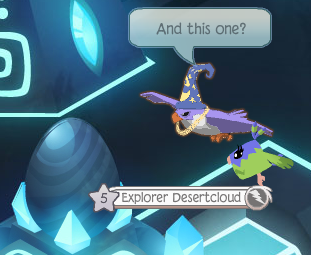 And do you have any ideas on what the new animal may be? (*Cough cough* Saber-toothed dinea pig) Go ahead and tell me what you think in the comments!